Audi has given the German Olympic team an A1 e-tron for the London Olympics. 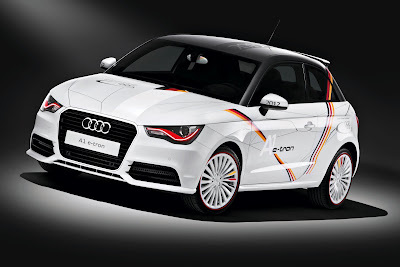 As partner of the German Olympic Sports Confederation (DOSB) and the National Paralympic Committee Germany (DBS) Audi presented the Olympic squad with an Audi A1 e-tron in the German colors. It is an electric car with a range extender. The A1 e-tron reaches a maximum speed of 130 km/h thanks to its power of 75 kW (102 hp). If the battery power is exhausted a compact combustion engine, the range extender, recharges the battery as required and in doing so increases the range to up to 250 kilometers. The A1 is used as an exhibition car and reinforces the shuttle service between the German House and the MS Deutschland cruise ship, which Audi equips with a total of 60 vehicles. The Ingolstadt based automobile manufacturer recently extended its partnership with the DOSB and DBS to the end of 2016.